Bread wheat (Triticum aestivum L.), feeding more than 35 percent of the human population and providing about 20 percent of calories and proteins consumed by humans, is a globally important crop due to its enhanced adaptability to a wide range of climates and improved grain quality for the production of baker's flour. Due to its complex polyploidy nature (hexaploid, containing A, B and D three subgenomes) and large genome size (17 Gb), the genetic and functional analysis of bread wheat is extremely challenging. The A genome, which originates from the diploid wild einkorn wheat Triticum urartu, has a genome size about 5 Gb, and is the basic genome of bread wheat and other polyploidy wheats. It plays a central role in wheat evolution, domestication and genetic improvement. To illustrate the genomic structures of wheat, the wheat genome research team at the Chinese Academy of Sciences, along with their collaborators, generated a high-quality genome sequence of T. urartu by combining BAC-by-BAC sequencing, single-molecule, real-time, whole-genome shotgun sequencing and next-generation mapping technologies. The scientists produced seven chromosome-scale pseudomolecules, predicted 41,507 protein-coding genes, and presented an evolution model of T. urartu chromosomes. Then they found that the collinearity originated from the ancient genome duplications in T. urartu were strongly disrupted because of extensive amplifications of transposable elements and widespread gene loss, compared to rice, sorghum and Brachypodium. Comparative analysis with the A, B and D subgenomes of bread wheat also showed that four large chromosomal structure variations occurred during wheat evolution. Population genomics analysis revealed that T. urartu accessions from the Fertile Crescent formed three distinct groups with different adaptation to high altitude and biostress, such as powdery mildew disease. The genome sequence of T. urartu provides a diploid reference for the analysis of polyploidy wheat genomes, and is a valuable resource for systematically studying the genome evolution and genetic variations in wheat and related grasses. It promises to facilitate the discovery of genes conferring important traits for the genetic improvement of wheat to meet the future challenges of global food security and sustainable agriculture. 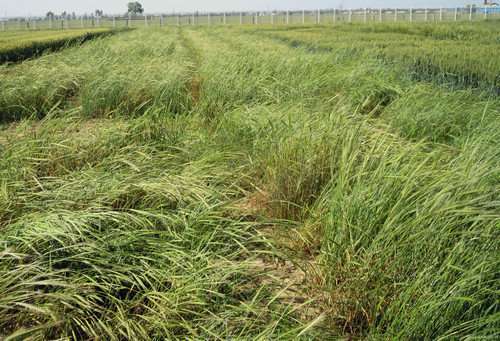 The research results were published on line in a paper in Nature with the title "Genome sequence of the progenitor of wheat A subgenome Triticum urartu."